Welcome to Zinzins.Net!!! Bienvenue !! Nous étions les zinzins de California, reconnus par l'Etat !!! We were the official "zinzins" of California, DMV approved!!! It was rare to find all eight of us together in the same place. 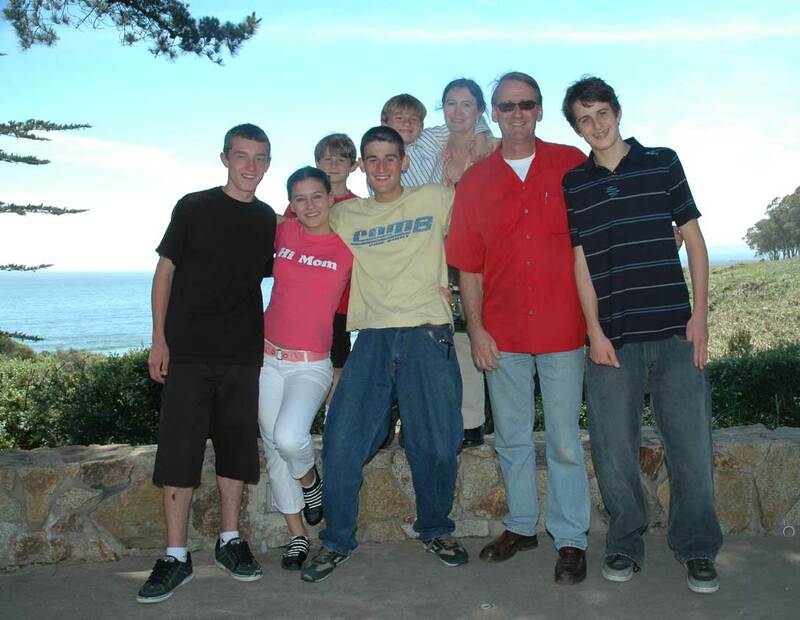 On Mother's Day in May 2006, all of the children accepted the parents' invitation to defer their pressing social obligations and brunch with us at Seascape Resort in Aptos, one of Santa Cruz's local hidden treasures. A tourist who had been admiring the view took this one, and we greatly appreciate her results. It's not perfect, of course, but we had all eaten well and were on a relaxing after-brunch stroll down to the beach. We all spent almost 16 years more or less together, from 1994 to 2010, but the times they are a-changin'. We'll update the site soon. In the meantime, like us you can still see the memories, and we have wonderful memories! They're all over this site! Our most recently added pages, dating from 2008 and 2009, can all be accessed through these three pages: 2008, 2009 and here. We are starting an alternative site for new pictures, starting in 2010. It's a WordPress blog, and it's here. We were and are a his, hers and theirs family, what they call blended. Charles and Alex, in the back row and 10 and 8 at the time of the above photo, are our joint efforts. Alban (16 in the picture) and Daphné (18), both on our left in the photo, are hers, and Nick (19) and Tom (16), on either side of their dad, are his. The collective made up our big, noisy whirlwind of energy. At times we were more agitated or churned up than blended, and at other times we were blended smooth as silk. It's all in the pictures! This website is a family photo album covering sixteen years in our collective life, from 1994 through the 2010. It is a tapestry, a portrait of these years arranged by people and themes. There are various ways to navigate this photo album. One is through links on every page, allowing you to jump around at will. Another starts with a summary of each year in our family history from 1994 to 2007, our own little "Carousel of Time." Beginning in 2008, this album becomes a photo journal, organized by year. And congratulations!!! You have arrived at one of the least visited sites on the entire Internet! visits since October 15, 2010. Sites like ours are proof that Bob Dylan saw the precursors to the Internet about forty years ago when he "Heard ten thousand whisperin' and nobody listenin'." We're whispering here. We wish you well if you should stop by and browse for a while. Website most recently modified in July, 2011. The site is a work in progress. We crave your indulgence. Not complicated. This is my stuff, the photos, the writings, everything except links to the Web. Do not use any of it (other than for non-commercial or educational purposes) without my prior written permission!!. This means YOU! !